NEW YORK A Senate panel has approved Mary Jo White's nomination to lead the Securities and Exchange Commission and sent it along for a final vote. The Senate Banking Committee approved White's nomination on a 21-1 vote. Sen. Sherrod Brown, D-Ohio, was the only member to object. White is expected to be confirmed by the full Senate and become the first former prosecutor to lead the agency that oversees Wall Street. The panel also advanced Richard Cordray's nomination to continue as director of the Consumer Financial Protection Bureau. But his nomination was approved on a 12-10 party-line vote. All Republican members opposed the nomination. They have also opposed the newly created agency and have expressed interest in curtailing Cordray's power. Republicans may try and block a final vote on Cordray's nomination. White, who previously served as U.S. attorney in Manhattan, told the panel last week that she would aggressively pursue enforcement of Wall Street and hold individuals accountable for misconduct. She also pledged to avoid potential conflicts of interest from her work over the past decade at a private law firm representing big banks and corporations. In a statement after the vote, Brown said he doesn't question White's integrity or skill as an attorney. "But I do question "Washington's long-held bias towards Wall Street and its inability to find watchdogs outside of the very industry that they are meant to police," he said. "Mary Jo White will have plenty of opportunities to prove me wrong. I hope she will," Brown said. Critics have complained that the SEC has failed to act aggressively to charge top executives at the biggest U.S. banks who may have contributed to the crisis that set off the Great Recession. White would replace Elisse Walter, who has been interim chairman since Mary Schapiro resigned in December. Cordray's nomination is less certain. 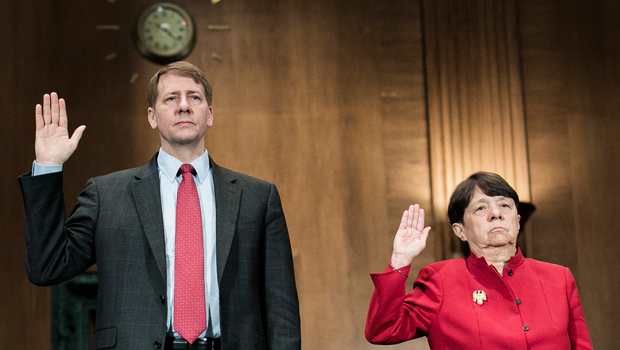 Obama used a recess appointment last year to circumvent Republicans and install Cordray as director of the consumer protection agency. The appointment expires at year's end. Republican senators reminded Cordray at his confirmation hearing that they want to see his powers as director of the agency curbed. A federal appeals court ruled in January that Obama violated the U.S. Constitution by using a recess appointment in the same way to place two people on the National Labor Relations Board.